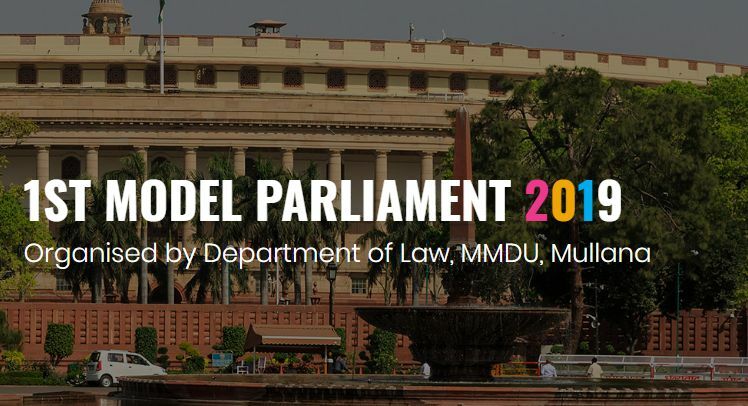 The Participant is required to submit the scanned copy of the REGISTRATION FORM complete in all respect along with screenshot of transactionon mmdu.model.parliament2019@gmail.com by 16thFebruary, 2019 and the hard copy of the same must be submitted to the organizers at time of event. There will be individual participation. The participants shall report at the venue hall by sharp 8: 30 a.m.
No formal dressing is required. However, it would be appreciated for wearing an attire similar to the politician of their constituency, carried in decent manner. Participants may use bilingual language during their speech. Constituencies would be allotted anonymously. There is no limitation on the number of participations from one institute. (i.e. any number of students can participate from one institute). Participants should seek confirmation of their registration prior one week of the event. Participants creating any kind of indiscipline shall be disqualified on the discretion of the judges. Participants thereby should adhere by the rules and regulations of the event. The rules of MMMP’19 resemble as far as possible the rules and procedures of Lok Sabha.